NEW! Samsung Flat-panel TVs with 30 channels of HD programming. Easy-access Plug-and-Play feature makes it simple to connect electronics. The La Quinta Inn Fort Stockton is located along the northern edge of the Chihuahuan Desert, not far from the banks of Comanche Creek. Visit nearby Annie Riggs Memorial Museum and the museum at Historic Fort Stockton. The area is rife with horse shows and rodeos. You can walk to the golf course and to a variety of restaurants. Fort Stockton boasts a number of parks, a civic center, coliseum, the Historic District with 16 points of interest, and a municipal airport. 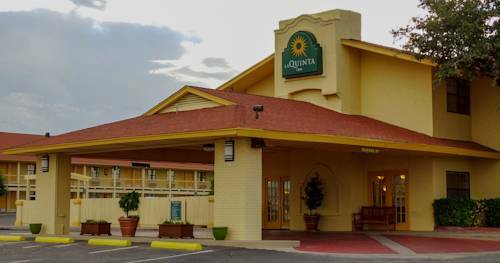 Spacious rooms at the La Quinta Inn Fort Stockton include free high-speed Internet access, a coffee maker, iron/ironing board, hair dryer, data port, voice mail and auto attendant, CD Music, and Internet-on-Demand. We have a refreshing outdoor swimming pool. Our Free Bright Side BreakfastTM is served each morning. Located off Interstate 10 (exit 257). Perfect for visitors to J. P. Aerospace Research Center. 1896 era bartender robot talks -- the only moving exhibit at the West of the Pecos Museum. ~50 miles from Fort Stockton. A landmark in Odessa, but the jackrabbit isn't all that large, and was beat out by another Texas jackrabbit in 2017. ~73 miles from Fort Stockton. A replica of Stonehenge, 70 percent the size of England's moldy original, is nicely maintained at the university entrance. Completed in 2004. ~77 miles from Fort Stockton.